After a long winter of settling in with us, our shelter-adopted cat, Nala, has begun to really relax and become a part of the household. It has been six months since we brought her home (at age 4.5) and her road from perpetually afraid to mostly relaxed has been slow. I have spent a lot of time with her to socialize her and build trust. Earlier this month I noticed how much attention she paid any time I went out the front door. As the weather improved I coaxed her out to the front stoop. 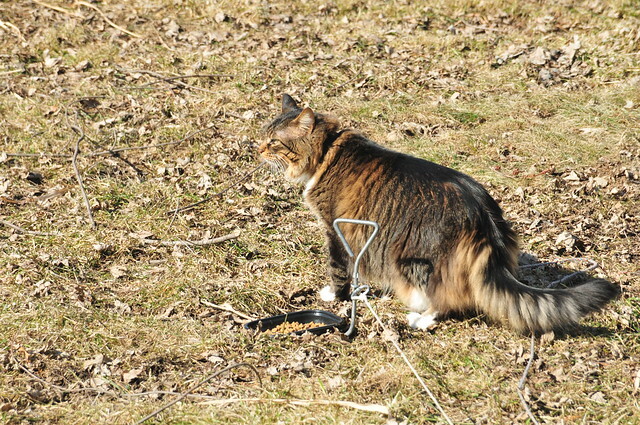 Since it seemed she enjoyed it - sort of - I took her into the fenced back yard and let her explore a bit while I was with her. Today I tried her out there solo, on a leash. I only left her there for about 15 minutes before seeing her hunkered down waiting to get let in. I brought her in and praised her courage. She ate a little, and is now sitting on her cat-perch staring into the back yard. Her courage and confidence increases slowly but surely. I would sure like to know what her past was really like. Since I do not, it remains a trial and error approach. Today seemed like a good step. In the past week she has chosen a couple of times to sit on the sofa with either Reena or me. Progress!